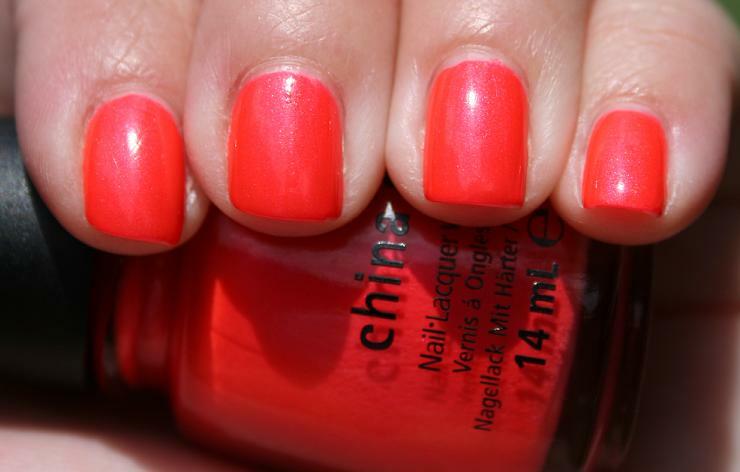 I ordered a few shades from the China Glaze Summer Neons collection and was dying to try this one first. The formula on this is leaps and bounds better than the formula on China Glaze's Poolside collection from 2010.... this applied like a dream, with no white coat needed on bottom to get this great pop of color and great coverage in just two coats. I think it's the slight hint of shimmer that makes the difference in the formula. Although it dried matte, I used Poshe as my topcoat and it dried super-fast. Scrangie mentioned that hers were too thick and she recommended using thinner first- but I had absolutely no problem with my bottle. Have you tried any from the Summer Neons collection? What's your favorite? I also ordered Pink Plumeria and Flirty Tankini.